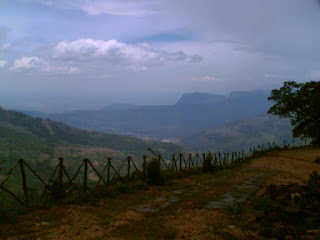 Some years ago while I was still schooling I went with a few of my friends to climb Kalupahana in the Knuckles region. The idea was to climb that mountain on the first day and camp some where there that night and to keep on walking towards Pallegama side across the Knuckles reserve. On a fine day we came to Bambaraella Estate via Mathale and Wattegama. By the time we reached the estate it was almost noon. Suddenly the weather too changed and it started to drizzle down and we began our journey despite a few warnings from the superintendent of the estate. The first bit was not so bad we kept on walking along the gravel road towards Kalupahana and then we picked a small foot path after getting some useful tips from the villagers. The path became narrower and narrower. The drizzle now started to fall quite hard on us. The biggest problem was the leaches. Each time someone was attacked by one of them we had to stop and apply soap and salt. Soon it was getting dark and we had no idea where we are leading to or when we could reach our destination. Our leader of the gang decided not to stop even for a second, no matter how many leaches climbed up your legs. We kept on walking even after the dusk. Now it was pitch dark in the middle of the jungle and rain was bucketing down on us. After further walking in to the jungle we understood that the foot path is now branching out every so often. (It was very dark and foot path was too narrow and those junctions may have been just our imaginations) We took a guess and selected a path and kept on walking. Suddenly we realized that there is no ending to this crazy walk nor we are reaching the ‘Kalupahana’. So our leader decided to camp out that night in the middle of the jungle. We made a sigh of relief and started examining every inch of our body for possible invasions of bloody leaches. I remember picking out at least 30 of them from my body. A dozen of them were bulging and full of blood. Some of my friends had even more. We put all our haversacks on the floor and covered it with a polythene sheet. Then we started pitching the tent. It was a narrow place we hardly could pitch a tent in the correct manner. And rain was falling on us continuously. We managed to pitch the tent with great difficulty and we all (8 of us) crept into it. The tent was built for only 4 people. That whole night I was sitting in one of the edge and was holding one side of the tent wall. I’m sure others also did the same. The water was gushing even through the tent as we have pitched the tent on the foot path and usually those become little streams after a heavy rain. Whenever I fell asleep I woke up with a sudden awful feeling of cold water on my shoulder as I have dropped my arm which was supposed to be holding the tent wall. Somehow or the other we spent that night. Unfortunately we could neither climb the ‘Kalupahana’ nor cross the Knuckles range that day. It took another few years for me to complete the task but this hike was one of the most memorable hikes in my entire life. I enjoyed this adventure--you live in such an interesting and exotic spot. Much more beautiful than I could have imagined. Wow, it might be a bad experience at the time but it must be a very good one right now. The scenery from your picture tells that the adventure must be continued, again and again. Thanks! I'll bring a few more stories about my hiking experiences in the future too. I am lucky to be born in such an exotic place that brings full of adventure. In fact the very reson we could notfinih what we planned that day was loss of blood. One of my friend was bleeding even on the next day noon from leach bites. So we had to return. The picture here was taken much later. Not the first or second. Infact during the time of the first trip, i didn have any cameras. I didn even thought of burrowing one. but now I regret it.. Yes this picture was taken recently and since then I have been to same area many a times. It is a place you can visit again and again.. Yes it was very risky. Infact you should never hike in unknown areas after dark. there is a very high chnace of geting lost. I never hiked after dark since that day. I learnt a good lesson. Tks all for your comments! Thanks mate! Thought the scenery was great and could have made the picture more beautiful with a better camera. Great!I like hiking with the view like that. You do not feel tired cos of the view all the way! Thnaks for your comments and I saw some excellent photos in your blog!! Yes, I remember that some of the trails at Knuckles never seem to end. Hiking at night is fun if the weather is fine and you have an experieced leader. It will be too slow if a person like me join it, who want to stop for every critter. I had such a wet campin experience at Bodhinagala and eventually we slept on a rocky clearing because the tents we took were useless. Yes night hiking could be interesting if you know the path. Also you can observe all nocturnal behaviours of animals and all sorts of creatures..very interesting too.